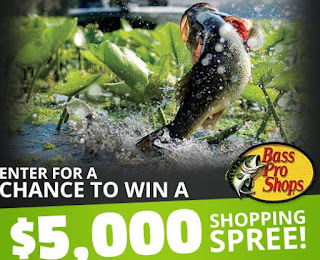 Enter to win a $5,000 Bass Pro Shops shopping spree. prizes: 1 Grand Prize: a $5,000 Bass Pro Shops shopping spree. locations during the Promotion Period. You may also enter by visiting content.basspro.com/content/sweepstakes/index.cfm?sweepsName=HuntForMonsterBass during the Promotion Period. Complete the entry form and submit as directed.